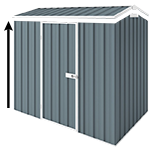 This extra high Absco shed is ideal for a smaller car or for a serious handyman. This model is 2.035m high at the walls and 2.3m at the gable making it easier moving in and out. Personal access / side door is included with this shed for easy access. This shed is DIY and comes flat packed with everything you need including a manual. You will need some tools and we recommend watching some of our videos before building. For permanent secure installation of your shed it is recommended to use anchors. To secure the wall panels to your concrete slab, you will need 16 anchors for this 3m x 4.5m shed. The Highlander range is engineered to withstand winds of up to the wind rating N2 (147km/h) and is ideal for non cyclonic areas, not available in cyclonic. By purchasing this shed (garden sheds only, garages and carports do not participate) you qualify to enter our competition to win your shed's purchase price. One lucky customer is drawn every month. Timber Flooring Kit (12) to substitute concrete slab. Made from 100% Australian renewable plantation grown timber. Comes with 10 Years Warranty.